Quickly bull-dozed through our work and headed for lunch. Muahaha!! Stomach first. Eelektra recommended either Amu Coconut Villa or Villa Seafood Restaurant (they’re opposite of each other in Kampung Cina, btw) for their seafood, which is supposed to be cheap and delicious. The latter was closed for the day, so we chose Amu instead. Initially the shop was empty. Nobody in sight. We were prepared for the worst, half expecting them to be closed as well. Luck was on our side, the owner claimed they were open, and we might just be the first customers of the day! 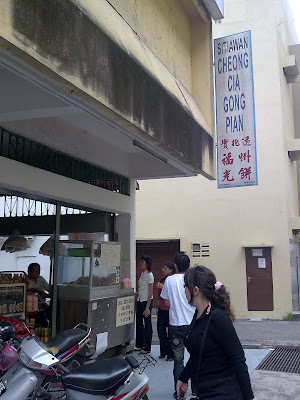 An interesting note though, they DO NOT serve pork, which explained the visit by a few Malay customers today. 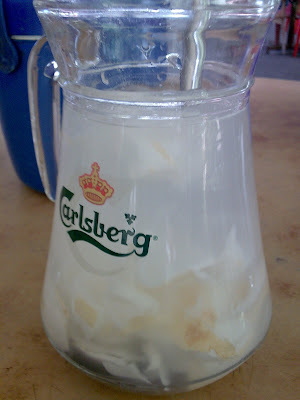 We ordered coconut juice to be shared, and it came in a jug, served with a bucket of ice. Refreshing on a hot day …. Kampung Koh in Sitiawan is famous for its garlic chilli sauce, which you would have seen at least once in every supermarket. 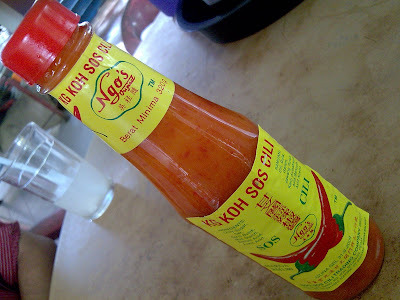 There are various brands selling the same Kg Koh Chilli Sauce. But don’t ask me, I have NO idea which one is the original. They served the Ngo’s Original brand, which was not too spicy, and not too strong garlic taste. Went really well with some of the dishes. We ordered 5 dishes for the 4 of us, as we were prepared to go all out on a feast, but holding back on the seafood for the sake of one of our team. Hehe. 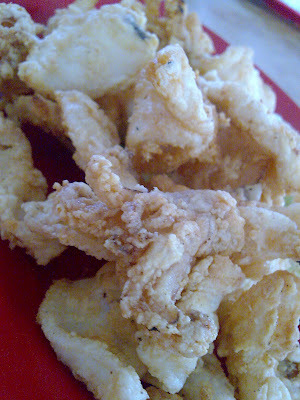 The deep-fried squids came in big chunks, less tentacles, and batter-fried to perfection. TallGal claimed the portion was too small, but I think it was reasonable, as probably the owners did not expect us to have a heavy lunch. The squids came with its own sweet chilli sauce. 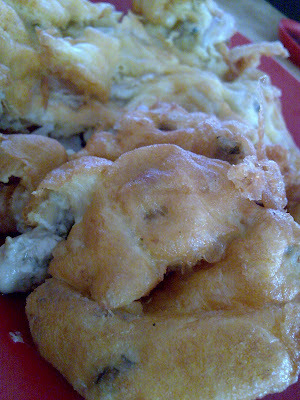 The oyster omelette (Or Chien) was crisp at the side, and filled with small oysters. The taste was OK, but it would be perfect if the oysters were larger, rendering a juicier bite. For the sake of KYT, we had to order a chicken dish. 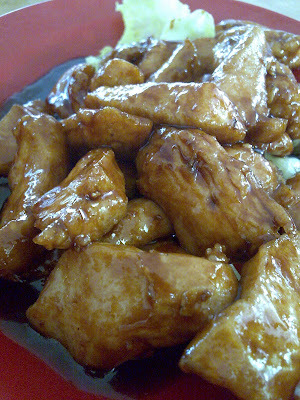 But no regrets, as the honey chicken came with chunks of boneless chicken meat, drenched in yummy sweet honey gravy. Not overly sweet or sour, the combination worked pretty well. Simply ordered a vegetable dish, to balance the carnivorous appetite. 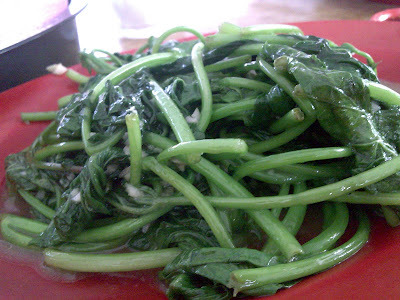 The sweet potato leaves (Fan Shu Miu) fried with garlic was moderate. Nothing special, but not bad either. 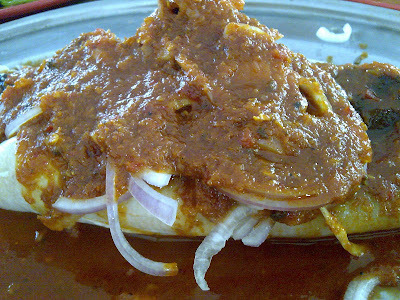 Personally, I loved the stingray, cooked nyonya style, steamed to perfection. The meat was fresh and slight chewy, rather than overcooked/undercooked with no texture. The gravy was very compatible with white rice, and not tongue-numbing hot. Very yummy, in my book. Location : Kg Cina, Sitiawan. Coming from Ipoh towards Lumut, turn left at the first Sitiawan junction, and go straight until you reach Sitiawan town. Once you reach a crossroad traffic lights, with KFC on your right, turn left and go straight for a few minutes, you’ll passed by 2 schools, and go further until you reach ACS Secondary School.Turn right at the next traffic lights after the school. Go straight til you reach another traffic lights, but go straight this time. 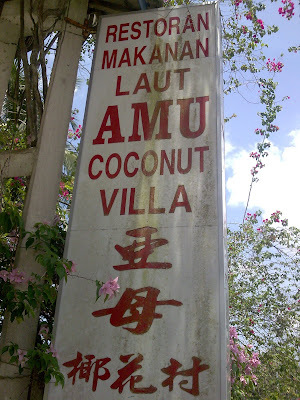 You will reach Amu Coconut Villa Seafood Restaurant on your left. Huh. Feeling full, satisfied, and sleepy (as usual), we crawled our way back to Ipoh. But not without some local products. 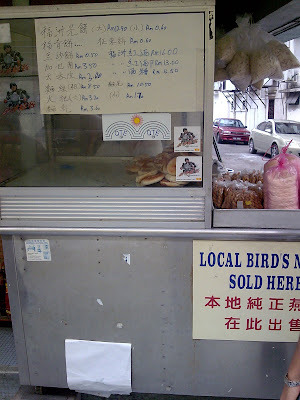 Sitiawan town is famous for its Kong Pneah, a type of biscuits made with spring onion and some with char siu. FCOE asked her friend, who is a local, for directions. We managed to reach this shop, right at a backlane between Courts Mammoth and Public Bank, which are on the same road as ACS. Sadly, the guy manning the stall (a smoking one, mind you, which made us think twice about the hygiene factor) burst the bubble and told us the next batch of Kong Pneah with spring onion and char siu will only be ready in an hour. Hmm. 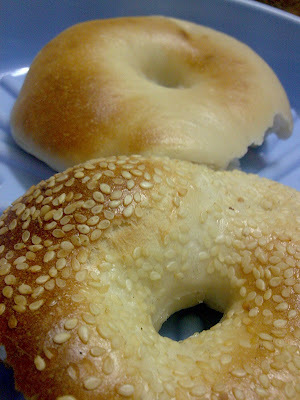 I bought the leftovers, plain one with and without sesame seeds. One bite, and I was hooked …NOT. It was so chewy, even with my young perfect teeth, was having some difficulties biting the bread/biscuit hybrid. 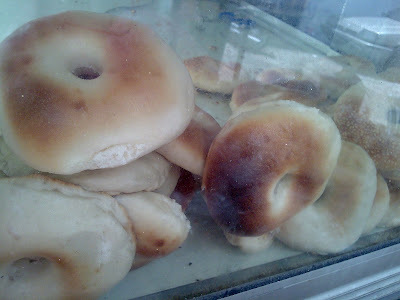 At 60cents/ piece, it was a pretty cheap option in case anyone is starving though. Sigh …. As we were nearly home, KYT woke up, feeling refreshed of course, and suggested we go Pusing, once again (=P) for the kuih. Hey! Great idea! 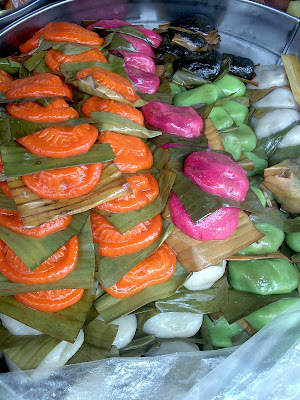 So off we went, AGAIN (second time this week) to the uncle’s stall in Pusing for some yummy nyonya kuih …. (refer previous post for the first purchase). anonymous : hehe, yeahlo, sometimes cant stop babbling la. 🙂 will try to cut short. wei the black splat (Kai See Tang) is very nice. this wk probably wont go liao, overdose! wmw : green bean one slight salty, but savoury. coconut one is the black one, a LOT of fillings! I forgot la, i bought 3 types only, i think there’s peanut and something else. I reli like ‘kai see teng’ a lot, though d name is a bit….Seafood wise my favourite is d Nyonya steam pari.Not too spicy..
tallgal : yeah, kai see tang is the best! 😉 i’d agree with the nyonya pari, though i kinda like the squid also. and i am gaining weight like no tomorrow. dun showoff! Wonderful you have skimmed through our area ! Next time you r here do check our manjung/sitiawan/lumut sections for some more recommendations of some sigmature local items !